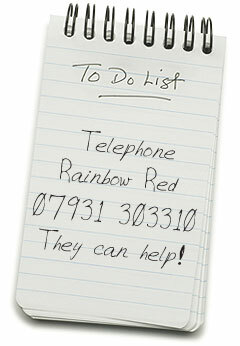 The term ‘Rainbow Red’ or ‘us’ or ‘we’ refers to the owner of the website whose registered office is 49 Florence Road, Walton-on-Thames, Surrey KT12 2AN. The term ‘you’ refers to the user or viewer of our website. By accepting these terms you create a legally binding agreement which, amongst other things, excludes rights which you would otherwise have and restricts Rainbow Red’s liability.